We design here, and we love it. 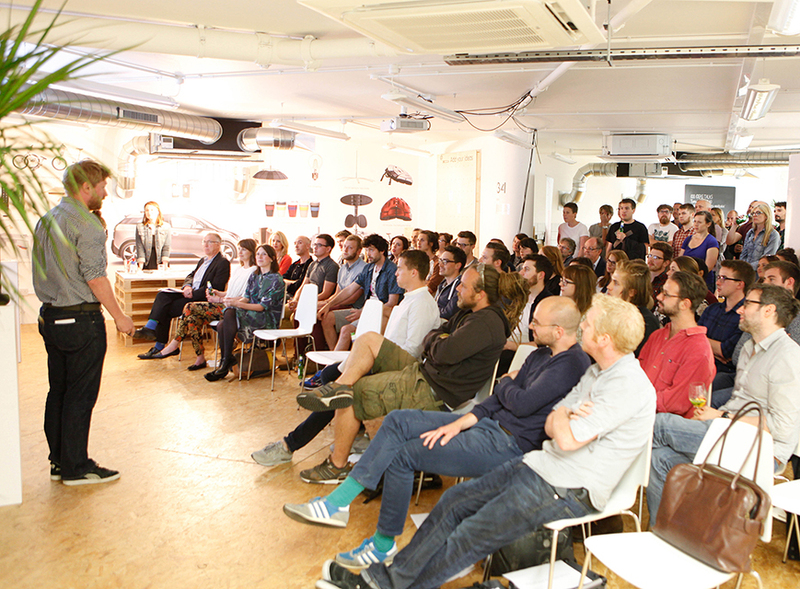 On July 8th, a lucky group of 80 people or so came together at the exciting OpenSpace just off College Green for an evening of basically being nosey and seeing where like minded creatives spend their days at the ​‘I Design Here’ talk. The event was a collaboration between the West of England Design Forum and Bristol & Bath by Design, the latter being a collective who are carrying out a comprehensive 18-month project mapping and measuring the value and impact of design in the city region. First up was Helen Johnston from 375, a sustainable brand engagement agency who are in fact based in ​‘Open Space’. Helen whizzed through a collection of shots of what the space has been used for, and also talked about the 100 ideas project – a digital publication platform that showcases 100 things to eat, think, do, taste etc around Bristol. The aim was to create a digital place to share ideas, connect with others and a way of building a community. It’s a great site, and can be found at www​.100ideas​.co​.uk. Next up was Lynne Elvins – a Design Strategist and Project Manager from Design Rally. Lynne is a Bristolian born and bred, but spent the early part of her career working in London. When she eventually moved back to Bristol, she saw the city from a new perspective. Bristol had changed from her hometown that she longed to move away from when she was younger, to an engaging and inspiring city. Lynne showed her desk at home – being more of a freelancer that works in many different places, her desk is in the back room of her house. She resisted the temptation to tidy and organise before taking the photo, as that would not be a true representation of what her space is really like. Like many of us, her space is surrounded by books, lists and general organised chaos. However, she rarely spends time at here, as more often than not she is travelling, and her ​‘I Design Here’ varies from train tables, to aeroplane seat backs to in the back of a car. Rather than using travel time as ​‘down time’ Lynne fills it with reading, listening to audio books or doing work. She told us of her love for History, and how she finds it relatable to her current work now. There are many examples of people throughout time, overcoming challenges and never just doing what they are told — a similar approach that she has to job. Throughout history, people have negotiated, pushed back, and created great things — doing the exact same thing in her work, creates the best projects and outcomes. Lynne also touched upon how, in the UK, Bristol is being underestimated as an important design capital, yet the opinions of Bristol in Europe is a much greater one, maybe having something to do with Bristol being the European Green Capital for 2015. She talked about how she feels that Bristol is a great place to get involved with sustainable design and to be able to make a change for the world to see. Lynne also referenced the recently produced election graphics broadcast on the BBC showing the spread of votes throughout the UK. In the sea of blue, Bristol stands out as a beacon of red. This one image shows that Bristol is different, Bristol is diverse, Bristol is gritty and that it’s time for the people of Bristol to make a difference. And that is why she is now proud to come back to her messy desk in Bristol, and be part of that change. Third on the list was Ben Steers – co founder of Fiasco Design – a creative agency based near Colston Hall. They have just recently celebrated their 5th birthday, and Ben approached the ​‘I Design Here’ topic by giving us a whistle-stop tour of the spaces they have called ​‘home’ over the last five years. We got to see a range of photos from each of the spaces they have inhabited, with a great infographic in the corner of each slide, telling us the square foot of each place. No matter where they have moved to, all of their offices have been within a square mile of each other, showing they really haven’t strayed from the heart of Bristol city centre over their years. Starting with 130sqft in 2010, their first 6 months were spent above a chiropractors, which was more like a communal kitchen with a desk in it for them to use. In the early days they worked on mainly pro bono projects, so workload was high, yet income, not so much. After being constantly interrupted by people making the tea rounds or hanging up their clothes on the back of the door, they decided to move to Bush House in 2011, an office space above the Arnolfini. It was the year of the recession, so the rent was subsidised and their square footage grew to 260sqft. Bush House was mainly a hot desking space, with a mix of independent start up businesses also working there, which also contributed to their client list. The space felt more open, but after 18 months, cabin fever set in, so they packed up their belongings again, and moved the half mile round the corner into St. Nicks House. The 380sqft of space was a serviced office block, where they were able to have 5 desks, a breakout space and even a roof garden to finally get some air. They made the space their own with the obligatory vinyls, bonsai tree and 45rpm vinyl mural on the walls found in many a design studio, giving the place some personality, and out weighing the fluorescent lighting and carpet tiles. After being there for 18 months and slowly starting to grow as a business, they were on the hunt for their ​‘own’ space. Something more independent that they could really make a mark on. After 12 months of looking in their select mile radius of the centre, they eventually found a ​‘funky office space’ advertised on gum tree. ​‘Funky’ turned out to be exposed brick — tick — and they snapped up the 960sqft space which gave them a reception, large breakout room and office space, and Fiasco have been residing there ever since. They finally have a space they are proud of, their clients enjoy coming to visit, it’s light, it’s open, it’s everything they have strived for. Ben left us with the thought that you not only have to enjoy the work you do, but where you do the work itself, and if you can find a place like that, it doesn’t feel like work at all. The last speaker of the first half was Ed Robin from Mytton Williams, based in Bath. Started by Bob Mytton and Sophie Williams 20 years ago, they moved out of London after having worked for Pentagram and headed to Bath. They wanted a different way of life, and nothing is more different than moving to a converted coach house in a quite mews compared to a bustling capital city. They work with a mixture of local and national clients on mainly print, packaging and digital projects. Ed talked about how there is inspiration and creativity all around us, especially the people around us. Every year Mytton Williams set themselves the challenge of creating a different calendar. These have ranged from a set of pencils — 12 for each month to sharpen down every day — to the latest project where Bob created a poster based on a Jazz artist every day, for 100 days. It’s this kind of work that showcases the encouragement of collaboration within our spaces and environments — from this project Mytton Williams collaborated with a jazz artists, a composer and a digital guru to create their Jazz calendar which is this year’s project. Ed’s ​‘I Design Here’ focussed more about the people around you and the importance of their influence. Their office space is light and open, ideal for collaboration and working together. They have a shared office space which was has been previously occupied by WEDF’s very own Jamie Ellul and is currently home to Mark Porter. They have a light open kitchen where they have lunch together every day — ensuring that their collaboration never loses momentum. The surrounding spaces in Bath are just as inspirational — recently they took a day out together on the canal, taking in a boat trip (and a few pubs along the way), all of this being right on their doorstep. They have a collective ambition of collaboration and a great work life balance, which is what their space greatly achieves. First up was Claire Paterson, Senior Creative Strategist at Taxi Studio, now based in Bath Road Studios in Bristol. Claire claimed that she was going to try and break the Guinness World Record for the amount of words spoken in five minutes, and although she wasn’t successful, she gave it a damn good shot. The quick fire view of Taxi life started off looking at the creative personality of both Taxi and Bristol in general, throwing up similarities of them both being restlessly creative, rowdy and reflective and proud and principled. She spoke about how they have Taxi Fest once a year where not only Taxi employees but their families get involved in a day together, with live music, food and a whole host of other fun things. We had a ​‘through the keyhole’ type look at their new studios where they have now been for two months, and caught glimpses of ping pong tables, football tables, a large CSI-type ideas wall, amazing meeting room pods, large spaces for them all to come together in the morning to eat breakfast and lunch together and some vintage boxing leather gloves hung on the wall, in homage to their mascot the honey badger, who is fearlessly creative. This amazing new office space comes from the mind frame of that ​‘if you want creative workers, give them time to play’ and that is exactly the kind of feel that you get from their new workspace. Studios are prophetic to a business, choose wisely. And to remember that we are ​‘goddamn lucky’, so whatever that four walls you work within are like, we are privileged to work in this industry, in this city. Second up in the second half was Chris, speaking from model makers Amalgam, who have been working in Bristol for the last 30 years. Amalgam’s studio is based in the Old Sorting Office just off Gloucester Road, with amazing light, space (and a great wooden parquet floor!). Their large, open space suits their needs in the terms that it is highly flexible with an office space and then a large studio spaces that moves and transforms depending on what they are working on- their space fits around their projects, not the other way round, giving it a very organic feel. We got to see an overview of their workshop, where they have worked on projects such as prototypes for Herman Miller, to large-scale TV props that are several feet high. Their team has grown to 35 people with various backgrounds, and their open space makes it great for communicating and collaborating with one another. Their offices and workshop floor are incredibly open, so that all lines of communications can be heard — which is important with a large workforce to ensure that everyone is happy. There was an immense sense of pride from Chris when he talked about how the space worked, how clients love coming to look around and knock down the misconceptions they have of model makers, and to have a nose round the building too! And even though the building is brilliant and quirky, it’s the people inside it that are the most important. Next up was Pete Fly, who gave us a quick introduction to the new ​‘Maker’s Space’ that he has just started to create in Old Market Manor, an amazing concept of a practical space in a 7000sqft factory that will house all different types of machinery to be used by the ​‘makers of Bristol’. Describing it as a kind of ​‘gym for makers’ they are in the process of bringing in machinery to be made available to people, where they can either pay for the day, pay for the week, or subscribe to a monthly membership. The space solves the problem that many makers face, of not being able to afford the expensive machinery that is needed for their craft, and the lack of space that is needed to house such equipment. The Makers Space will provide this service, as well as a mixture of admin and bench space, to create a place that is ​‘built by us and lead by the community.’ It’s so exciting to see the start of such an ingenious and much needed project, and I can’t wait to see the final outcome. Watch this space! Last but not least, speaker number eight of the evening was designer and producer, Tom Metcalfe. Currently working in the collaborative, co-working space Pervasive Media, based in the Watershed. Tom has worked on projects such as ​‘The Raincloud Project’ and also puts together the ​‘This Happened’ talks — an event where speakers come together in various, usually out of bounds, spaces within Bristol (the last one being at the top of Colston Tower). Tom started off with why he works in Bristol – 3 years ago, like many other non-Bristolians, Tom moved to Bristol due to his partner’s career, rather than his own, showing that Bristol is a lucrative place to be, even if you are not involved in the creative industries. So from Dundee, he moved to Bristol, and started working in a space in Hamilton House. Over time, the Watershed heard of what he did and got in touch. Tom calls this ​‘jammy’, we call it his amazing hard work. From their meeting, Tom became a resident and partner at Pervasive Media Studio and the rest is history. There are an eclectic mix of people working in this free space, where you have to be invited to become a resident. Tom talked about how it is an amazing place to work and meet people and every week on ​‘Open Fridays’ people hot desk in the afternoon, after lunch, which makes it an even better place to meet more like-minded creatives. Tom talked about collaboration in the fact that it is a great way to bring people together and work together — don’t try and be great at everything, or do everything. Be aware that you are great at certain things, and connect with others that will create amazing collaborations. Tom says that he will be sticking in Bristol for a while, it’s a diverse, incredible, collaborative city, and we couldn’t agree with him more.